Providing you the best range of ladies designer printed shawls with fur trim, pure wool shawls with digital print & fur trims, wool jamavar fur cape, wool fur shawls with embroidery, fur shawls and pure fine wool fur collar cape with effective & timely delivery. We offer Ladies Designer Printed Shawls with Fur Trim. 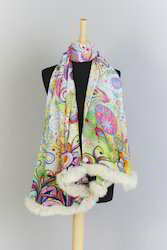 We offer Pure Wool Shawls With Digital Print & Fur Trims. 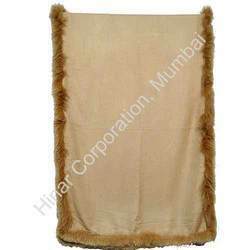 We offer Wool Jamavar Fur Cape. It is 100% pure wool shawls with rakun fur collar/fur balls 70 x 180cms assorted designs / colors available. We offer Wool embroidery fur shawl digital printed with fur shawls. We offer wide range of real fur shawls in various models. We offer real fur & faux furs as well. Light weight printed shawls with Fur etc..